It sounds a little scary. It can definitely feel a bit unnerving if you think it's happened to you. 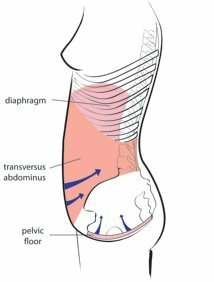 Diastasis Rectus Abdominis (AKA: Diastasis Recti, Diastasis, Abdominal Separation or -- my least favourite of all time -- "Mummy Tummy") is the thinning and spreading of the connective tissue in the middle of the Rectus Abdominis muscle. That's the "six-pack" muscle, BTW. As your pregnancy progresses and you get to the BEHEMOTH stage sometime around your third trimester, baby's pressure outwardly on your abdominal muscles forces them to give way a bit. They move away from their intended attachment point, the connective tissue in the middle known as the "linea alba." DRA is actually a totally normal and expected part of the pregnancy process. It's one of the ways your body changes in pregnancy to accommodate your growing baby. Most women will see the gradual tightening of the linea alba tissues and the closure of the separation over the long-term postpartum period. 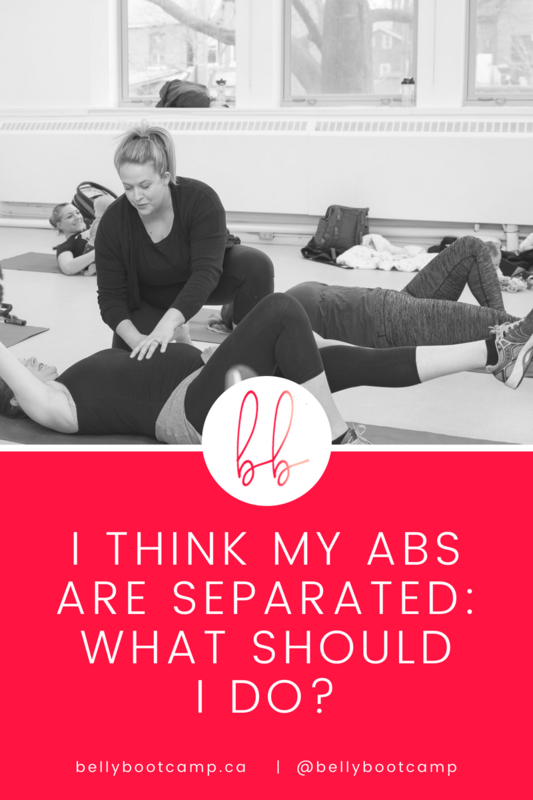 It will take longer without the support of a Pelvic Health Physiotherapist and, ideally, a qualified Postpartum Fitness Expert who can help you to determine which movements are safe for you or more likely to contribute to the separation. There are a few telltale signs you might be maintaining a DRA past the immediate postpartum period. It would be absolutely normal to expect the separation to take several weeks, even 2-3 months or more, to gradually move together after baby is born. ...you may have an abdominal separation that requires some help to heal! First, get thee to a Pelvic Health Physiotherapist for a one-on-one treatment plan. Physiotherapy is a standard part of postpartum care in some countries but not yet in Canada, although people like us can make more noise about it and tell our politicians we want better post-birth care! Physiotherapy is covered by most insurance plans and you shouldn’t need a doctor’s referral. Your PT will asses your pelvic floor and abdomen as she would assess any other muscles: by palpating with her fingers, & checking the strength & length of the tissues. Wondering how long it will take to get back to your favourite exercises? Check out this interview with a Pelvic Health Physiotherapist! You can get tons of healthy family-friendly recipes and meal planning advice here! Even if you don’t think you have pelvic floor symptoms, the activation of your deep core muscles, which will help to restore closure and/or tension to your abs, includes the function of your pelvic floor. No core muscle works in isolation. For a strong core, you must activate your transverses abdominis (TVA) and your pelvic floor muscles together. On your own, begin first by paying attention to your breathing. The core muscles are built to work as a system, centred around the breath. By learning to breathe deeply, with good alignment, we can activate these neglected deep core & pelvic floor muscles to move them through a full range of motion. We get better breathing, better healing, better energy, and better functioning core muscles! Here’s why breathing is the “core exercise” you might be missing! Try these breathing tips to restore alignment to your pelvic floor & core muscles. What can you do? TONS! Most mamas can do typical strength training workouts, especially with the guidance of a qualified instructor who can help you to align yourself optimally, breathe to relieve abdominal pressure, and help you progress safely. If you do have Diastasis Recti &/or pelvic floor dysfunction, these 5 safe core moves will help you re-connect & strengthen. During your everyday life, start paying attention to the following mama tendencies, all of which might contribute to the slow healing of your abdominal separation. Hold your breath when you lift something heavy or pick up your little one; instead begin to exhale (see breathing post above) to relieve abdominal pressure just before/as you begin to pick up your toddler or lift the grocery bags from the trunk. Think: "Blow before you go!" It's a lot of information. The truth is, a holistic approach to restoring your core in postpartum is the best way to ensure you feel strong and confident for years to come. Quick fix belly wraps and hours and hours of "kegels" just don't work. We know that now. Check out this article for some MUST-KNOW tips and a workout video to help you connect with your deep core & pelvic floor at home! And feel free to reach out to us on social media @bellybootcamp or book a free consultation to discuss affordable online training or in-home personal training. Our award-winning BB classes are also designed to be safe for mamas with DRA and pelvic floor symptoms. Join us and start safely & effectively working toward your postpartum fitness goals!